Look, down into the sea! Is it a fish? Is it a submarine? No, it’s one of the characters featured in the following 142-minute film, co-produced by Warner Brothers and DC Comics. It was directed by James Wan; and it stars Jason Momoa, Amber Heard, Patrick Wilson, Willem Dafoe, and Nicole Kidman. Plus, as an extra added bonus, the Blu-Ray edition comes with a number of special features, including documentaries, behind-the-scenes featurettes, interviews, visual essays, a theatrical trailer, and much, much more. Please enjoy. Ever since I was a small boy, my father would tell me that one day I would grow up to be someone special, someone unique, all because my mother was from Atlantis and their love would make me into the man I am today. But, to be completely honest, I’m not entirely sure what that is exactly? After all, if you listen to Mera (Amber Heard), my new aquatic friend, I’m supposed to be the next Atlantean King and the savior of humankind! 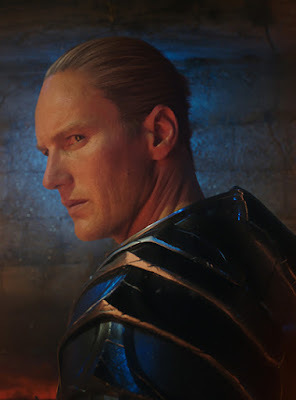 Whereas my brother Orm (Patrick Wilson), on the other hand, thinks that I’m an outcast, a mutant, and an estranged sibling, spit-spit, simply because I'm trying to prevent him from uniting the seven undersea kingdoms so they can all go to war with the surface world. Well, I can’t allow that to happen, can I? I can’t allow my half brother to rise up from the deep and take down the entire planet. A planet, I hasten to add, that’s full of exotic countries and wonderful people I sometimes want to save. So, in a roundabout way, maybe Mera is right, and I should be some sort of savior. Me, Arthur Curry, also known as Aquaman (Jason Momoa). But then again, that’s most probably why what next transpires goes glug, glug, glug, when I quickly take a trip around the world. As an ancient key historically does its thing – a long lost map points me towards a beautiful bit of bling - an army of soldiers go boom-bash, boom-bash, ting – and at the end of the day, please remember, it’s always good to be the King. Before I begin, please allow me to make one thing perfectly clear. I’ve been following Aquaman’s exploits since the mid-1990s, and during that time, I’ve read most of his adventures, be it in the pages of the Justice League, his last three ongoing series, as well as his numerous spin-off titles. So, as you can imagine, I have a pretty good idea about his personality, his background, and how he has evolved over the years. An evolution which has now been amplified and transformed into a full-length motion-picture comprised of cinematic vignettes. Well, with all due respect, as much as I enjoyed this adaptation, I couldn’t help but notice how it was partly reliant on other cinematic sources to tell its tale. This included films like 'Indiana Jones and the Temple of Doom', circa 1984, mainly that part of the plot which involved Arthur tracking down an ancient artifact in a foreign country with the help of a beautiful woman by his side. Next up would be 'Blade Runner' and 'Avatar', circa 1982 and 2009, which aesthetically seemed to have spurred the visual look of Atlantis, Xebel, and the other undersea kingdoms, mainly with the use of a high contrasting color palette, offset by neon tones, earthy textures, and vivid lighting effects. After that, I would have to mention the 'Star Wars' saga, circa 1977 to date, simply because certain sequences were either derivative or similar by design, such as the grand undersea battle between the different nations, the incremental love story between a princess and a rogue, the political and regal aspects of the plot, as well as the hierarchical relationship between its two principle villains -- Ocean Master and Black Manta -- who both strangely epitomised Darth Vader and Boba Fett respectively, with the former hiring the latter to track down his opponent. And last, but not least, I would also like to include such films as 'Black Panther' (the dual), 'Piranha' (the Trench), and 'The Little Mermaid' (the love story), to name but a few, all of which seemed to have slightly inspired the narrative as well as the visual look of this production. Come to think of it, while I’m on the subject of this film’s narrative, I did notice that structurally it flowed in a very episodic fashion. After all, it started with a brief prologue (i.e. 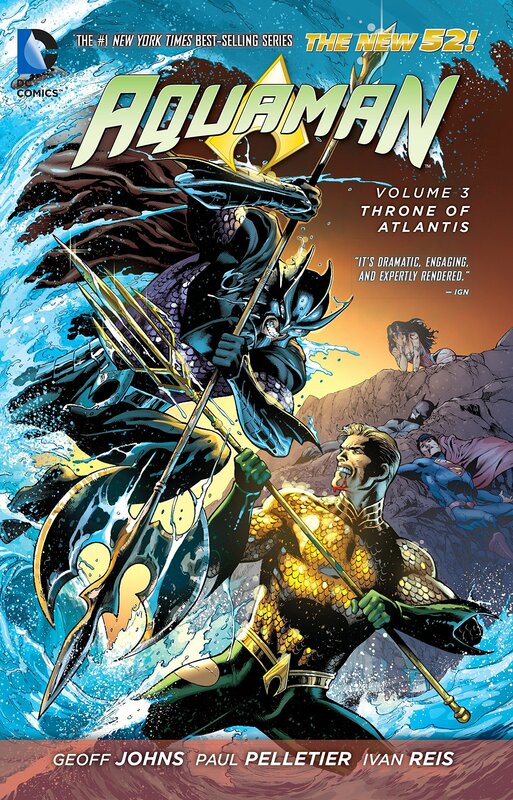 how Arthur was born), then it established his current status-quo (saving a submarine from being hijacked by a group of pirates), before defining the plot (Atlantis needs help), the pseudo-love interest (Mera), the main villain (Ocean Master), the backstory (Vulko, his legacy, etc), and the final objective (get the trident and become the King). In fact, so much stuff happened throughout the course of this aquatic-adventure; that in some way it's pacing felt labored and certain subplots felt moderately ill-conceived. For instance, one subplot featured Vulko teaching a young Arthur Curry about Atlantis, his powers, and his vast nautical heritage. But, for some unexplained reason, their initial meeting wasn’t included in the final film and this made things seem a little off (almost as if it was edited out by mistake). Similarly, the Black Manta subplot didn't seem to sit too well either. Although, in this case, I partly blame the narrative for establishing Manta as a villain with a need for revenge, yet treating him like a henchman who was used as a patsy and a pawn. As far as the jumbled pacing was concerned, however, that was affected due to those sporadic flashback scenes, the overall structure of the film, plus the amount of explosions going off whenever something important was being said or carried out. As a matter of fact, these bang-boom-bangs happened so often -- at least five times in total -- that after a while it started to get irritating, repetitive even, and it inadvertently hindered the story when it segued from one part of the plot to another, acting as a visual punctuation, so to speak. Anyway, that’s enough of that for the time being, because I think now is a pretty good time for us to sit back, relax, and check out the following filmic facts: (1) ‘Warner Bros.’ first released this two-hundred-million dollar production in the UK on the exact same day they celebrate ‘Constitution Day’ in India. It was on the 26th of November, 2018, and they clawed back one point one billion dollars at the Box Office. (2) Loosely translated, this project was entitled ‘Man out of the Water’ in Bosnia and Herzegovina; ‘Aquamarine’ in Lithuania’; and during pre-production, it was given the working title ‘Ahab’. 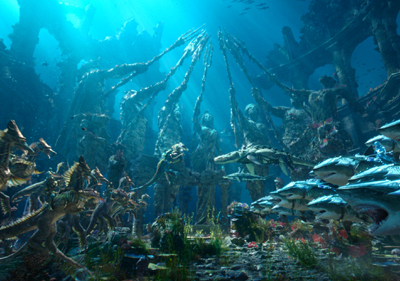 (3) A large portion of this movie was roughly based on the Aquaman six-part storyline, ‘Throne of Atlantis’, which was written by Geoff Johns, drawn by Ivan Reis, and published in 2012, whereas the visual inspiration was based on the Peter David and Martin Egeland version of the character, circa 1994 to 2001. (4) Along similar lines, you also might like to know that the first Manta helmet was based on the Golden Age Black Manta helmet, which was a conventional helmet sporting a specialized piece of breathing equipment. (5) One of the taglines used to promote this picture, states, ‘Home Is Calling’. (6) Even though the majority of this movie was shot inside Village Roadshow Studios, Queensland, Australia, some parts of it was also shot on location throughout the world. This includes Italy [Erice], Canada [Newfoundland and Labrador], Morocco [Merzouga and Erfoud], and of course, Australia itself [Southport, Queensland, and New South Wales]. (7) If you look fairly closely, you might have noticed that some of the actors who star in this movie have also starred in other comic book inspired productions. For instance, Patrick Wilson played Nite Owl II in ‘Watchmen’, Willem Dafoe played The Green Goblin in ‘Spider-Man 2002’, Nicole Kidman played Doctor Chase Meridian in ‘Batman Forever’, Djimon Hounsou played Korath in ‘Guardians of the Galaxy’, Temuera Morrison played Abin Sur in ‘Green Lantern’, Randall Park played Jimmy Woo in ‘Ant-Man and the Wasp’, and Dolph Lundgren played The Punisher in his 1989 movie. 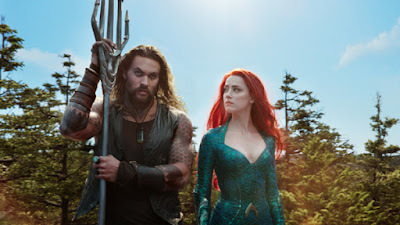 (8) After this flick sunk a battleship, Jason Momoa lent his voice to the animated-adventure, ‘The Lego Movie 2: The Second Part’; Amber Heard starred in the dystopian-drama, ‘Gully’; and Patrick Wilson starred in the TV show, ‘The Other Two’. Okay. So where was I? Oh yes. I remember now: As I was talking about Aquaman, Orin, Arthur Curry, and the King of the seven seas. Otherwise known as that fish-faced fool who featured in a film that’s fairly fantastic. Seriously, folks, despite some of my previous criticisms, I really did enjoy watching this comic book movie and could appreciate it for what it is, rather than hate it for what it isn’t. Which, in this case, is a version of the original character yet slightly removed, largely due to him being played by a huge Hawaiian man with American roots, instead of a medium-sized Greek man with ancient roots. Well, let’s face it; just like Wonder Woman before him, Arthur also derives from Athenian ancestry dating back to the fourth century BC (or thereabouts), which, for all intents and purposes, doesn’t seem to be very relevant to the current status-quo. Not that this is a bad thing, mind you. Not totally, anyway, but I thought that it was well worth mentioning in order to justify that being authentic isn’t always necessary! Besides, sometimes we have to be open to something new, something fresh, otherwise, we wouldn't have been introduced to Jason Momoa's splendid rendition of the title character. Overall, I thought that he did an amazing job, especially during those fast-paced, action-packed, fight-scenes, and whenever some levity was required. 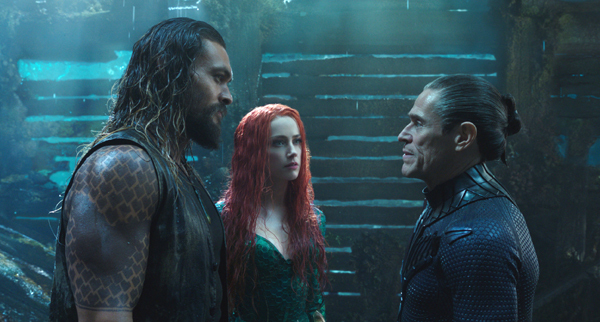 What’s more, some of the other members of the cast did a pretty decent job as well, such as Amber Heard, who played Mera: The very stoic yet regal love interest; Willem Dafoe, who played Vulko: The aquatic version of Alfred Pennyworth; Yahya Abdul-Mateen II, who played Black Manta: The angry assassin out for revenge; and Patrick Wilson, who played Ocean Master: The very sinister yet noble bad-guy. So, all in all, everyone deserves a well-earned pat on the back, pat-pat-pat, even though some were let down by dodgy CGI and de-aging effects. Mainly, Nicole Kidman and Temuera Morrison, who still did their best under the circumstances. So, regardless of its lack of authenticity, this film is a good film and is definitely worth a watch because it's fun, enjoyable, and full of aquatic goodness. 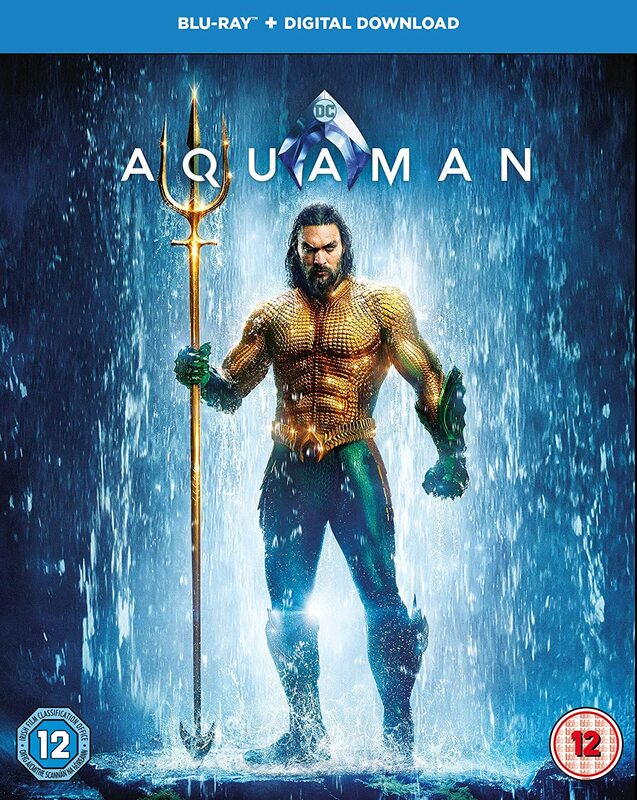 AQUAMAN is available on 4K UHD, 3D, Blu-ray™, DVD, and Digital Download from the 8th of April, 2019.